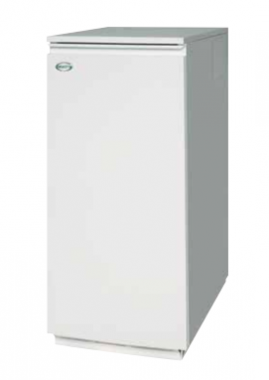 Vortex Pro Kitchen/Utility Regular oil boiler is a condensing unit which has been designed as a floor standing unit. Designed and manufactured by Grant, it is ideally suited to a kitchen or utility room installation. It comes with an output rating of 36 to 46kW making the unit perfect for those larger homes with more than one bathroom. This boiler has an efficiency of 90% making the unit A rated. It features an internal condensate trap that has an external option and is compact in size with at only 348 mm wide. Other key features include a high efficiency circulating pump, front service access and a Riello RDB burner with plug and socket connection. It is suitable for a plug-in programmer. This Regular boiler needs to be installed as part of a heating system alongside a hot water storage cylinder, cold water storage tank and a feed and expansion tank. This means it may not be suitable for smaller homes where space is limited. Other available outputs are 15 to 70kW so you can be sure there will be a unit to suit your home. It includes 5 years warranty so you can have peace of mind that you have purchased a highly reliable unit that won't let you down.